Sure, it sounds complicated, but it’s an important part of what enables your car or truck to drive around a curve without having the tires skip and slide along the road. 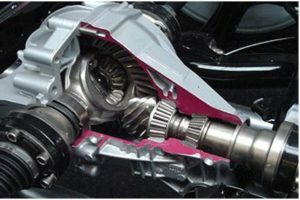 The good news is that there’s really only one thing you need to know when it comes to your car or truck’s differential: The technicians at your local Cottman center understand everything there is to know about differentials… even the limited slip differentials used in many of today’s cars or trucks. They know how to test them, and they know how to fix them when they aren’t working properly. Everything from a simple leak to a complete rebuild, the technicians at your nearby Cottman center can find and fix the problem, and get your car back on the road, fast. Think your car may have a differential problem? Not sure what’s wrong? No problem: Call your local Cottman center and let them know what your car’s doing. They’ll check your car, and if it’s the differential, they’ll let you know exactly what it’ll take to get it your car working the way it did the day you drove it off the showroom floor.